Being a library volunteer is fun and a great way to fill your services hours or start getting the feel of what a job is like. Because of this, we prefer teens to visit or contact us themselves to show us their responsibility and reliability. 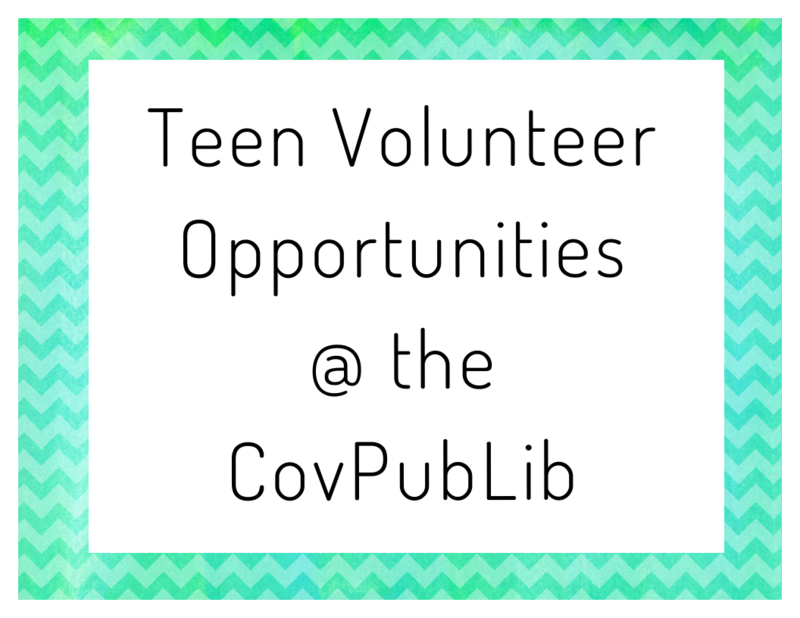 To become a Teen Volunteer at the CovPubLib, you must be in grades 7-12. Completing your services hours for school or another requirement? We're happy to sign your school certification letter or provide other proof of service once you've completed your time volunteering. Contact the Teen Librarian by calling the Youth Services Department, or by dropping off the paperwork you need signed for librarian in the Youth Services Department. Once or twice a month (from October—May), we host a drop-in event (i.e. no registration required) for teens who just need a few volunteer hours or who want to try volunteering with low commitment. These events are usually good deeds for the library or community. Throughout the year, the Youth Services librarians will host programs and/or story times and could benefit from volunteers that can help assist with tasks throughout these events. Beginning in May, applications to become a teen volunteer for our SRP will be available as we offer an abundance of volunteer opportunities for a six-week period. Teens may ask for an application, fill out their availability depending on the opportunities offered, are asked to attend a Teen Volunteer Meeting prior to the beginning of the summer reading program, and will be expected to volunteer for the dates and times assigned to them over the course of the six weeks. Teens' availability is entirely up to them--the Youth Services Department will provide a letter confirming the amount of time spent volunteering at the end of the program. When possible, we will try our best to accommodate particular community service needs. But due to scheduling of programs and activities and the library’s needs at the time, we cannot always guarantee last minute requests. Please strive to reach out ASAP about any requests you may need to fulfill and we will work to accommodate your needs! You can call and ask for the Teen Librarian (401-822-9102 for the Youth Services Department) with any questions. Please visit the library to pick up a copy of the TEEN VOLUNTEER GUIDELINE & F.A.Q. as well as the TEEN VOLUNTEER APPLICATION in-person to become a volunteer.